Symptom: Snagger releasing ball too early, or not lowering enough to grab ball. The snagger mechanism on a Lost World pinball machine uses both optos and microswitches to determine the ends of travel. Or more accurately, the microswitches are wired in series with the motor to cut-off the power when at one end or the other. The game MPU has no knowledge that this has occurred. The MPU instead uses the optos to determine when it is at one end or the other. So the microswitches are acting as safety switches to stop the motor if the optos fail or are unplugged, etc. The game code also has a timer to flag an error and disable the snagger if it doesn’t reach one end or the other in the allotted time. When using the special test function in the Diag->Lost menu, the display will show the status of the optos, but relies on the switches to stop the motor at one end or the other. But during game play, the optos are used. So adjusting the switch levers had no effect. Over time, the gears and belts develop mechanical play or slop. The original designer never accounted for this. The only adjustment is the center of travel, basically the flag that interrupt the optos. This can be loosened, rotated, and re-tightened on the motor shaft. One could also loosen one of the pulley screws and accomplish the same thing. But this only adjusts the center of travel. If I adjusted it so that the ball would release and fall into the Jeep properly, the snagger wouldn’t lower far enough at the other end to grab the ball. If I adjusted it to grab the ball properly, it wouldn’t raise far enough and the ball would release on the edge of the Jeep and just sit there. The largest source of play is the cam on the left side of the last hinge of the snagger. As of this writing, Marco Specialties sells the shaft and the end housing of the snagger. I wasn’t able to remove the last pulley due to damage of the set screw, so replacing it wasn’t an option. What is really needed is a way to move one of the optos so that the motor runs a little bit longer to account for the slack in the mechanics. I removed one of the optos and with a very small Dremel bit, created slightly curved slots for the opto leads in the circuit board. This would allow for the opto to be adjusted. Showing new position of opto before final adjustment in the machine. After determining the ideal position for the opto and adjusting the center travel (as mentioned above), I put a little drop of hot-glue on the top side of the board at the end of the opto to hold it in place. The snagger now works perfectly. Not the prettiest solution, but sometimes things need a slight design tweak. If there were more Lost World machines out there, I’d design an aftermarket board that would make this a lot easier. The Wizard of Oz (WOZ) pinball machine was state of the art back in 2013/2014. There were many things about it I admired, the biggest standout were RGB LEDs used everywhere including the lowly general illumination. Previously pinball machines had fixed colors for their lights. On this machine every LED can be individually controlled to be any color. There are now 4 generations or versions of light systems for this pinball machine. The first three are all controlled with a serial signal that passes through a long chain of LED controller chips. If any chip in the chain fails, it causes all the other LEDs downstream to function incorrectly. The original system used in machines built prior to September, 2014, is often referred to as “5 volt unbuffered”. This is the least reliable system. There is a later system referred to as “5 volt buffered”, where the serial control signals are buffered with a driver chip. I was told by a person who works at Jersey Jack Pinball that this is the most reliable of the serial systems. There is another referred to as “7.5 volt”, which uses a 7.5 volt power supply rather than 5 volt. The serial control signals are also buffered. And finally there is the “Version 2.0” system, which uses an entirely different LED control scheme and is the system used on newly built Wizard of Oz machines, as well as The Hobbit and Dialed-In. My customer has a machine that was manufactured in September 2014 (the date of manufacture can be found on the rear of the machine), and it contained mostly 5 volt unbuffered light boards. There were probably at least 3 boards failed, including some of the large ones. Given there were no replacements available for one of the large boards, we decided to upgrade the machine to the Version 2.0 system. What follows are some tips to anyone who is upgrading to the 2.0 system. This was one of the early 2.0 upgrade kits (ordered in January 2018) and some things mentioned below may have changed/improved in the later kits. I was warned it would require over 20 hours for a novice to do the upgrade. With my experience working on pinball machines, I was able to do it in 10 hours with assistance from my customer. (This was working straight through without a break. If I do it again, I’d split it across 2 days.) The machine was an Emerald City Limited Edition (aka WOZ ECLE). There were 11 pages of printed instructions provided with the kit. Initially the instructions are pretty concise with photos. There are variations in the way the machines were produced, so sometimes you have to connect the dots and deviate from the instructions. 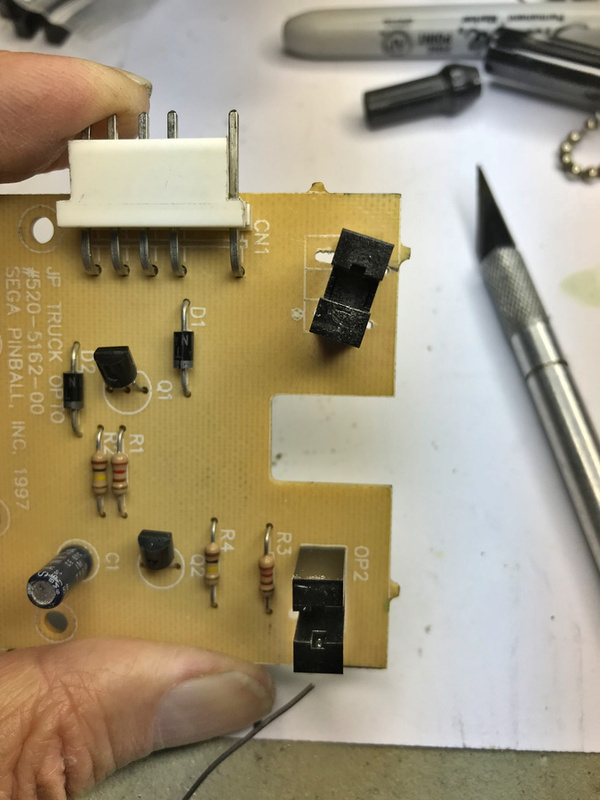 The most time consuming aspect of this project is each GI or single RGB LED board has different mounting holes than the original boards. There are about 30 of these total, which translates into positioning, marking and drilling pilot holes for the new mounting screws on all three playfields. One of the inaccuracies that became apparent was that there were two different lengths of #4 sheet metal screws (SMS) provided in the kit (1/2 inch and 3/8 inch), but only the 1/2 inch length is referenced in the instructions. This caused me to run out of screws later in the project. 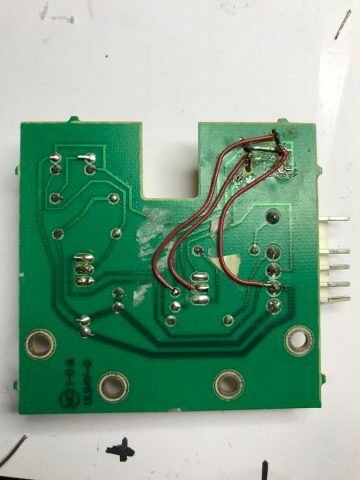 The correction here is that the 1/2 inch screws are used to secure the large boards to the playfields, and the 3/8 inch screws are used to secure the 2-holed, single RGB boards to the playfields (the boards without the bracket or the nylon spacers). About half-way through the project the instructions were becoming less concise. One of the big annoyances was the kit included no brackets for mounting the new power supply to the back of the cabinet. The instructions say to use a standard “L” bracket, as if everyone has those lying around. We didn’t, and it would have been an hour round-trip to the nearest hardware store. My customer had recently repaired a chair with some 1 inch “L” brackets, and we stole those from the chair so the WOZ upgrade could continue. The other related error is they say to use an 8-32 by 1/4 inch machine screw to secure the “L” bracket to the power supply. The mounting holes for the power supply are metric, and fortunately I had some metric screws on hand. An M4 x 6mm would be a good size to use. Talk about lazy… how hard is it to include some hardware to mount the power supply to the cabinet? Another problem that surfaced towards the end of the project was the cables for the single LED boards were too short. The instructions don’t give suggestions regarding the orientation of the single RGB LED boards around the inserts. I positioned them in a way that made it easy to access/drill the new holes, but in a couple of cases, this positioned the connector further away from the controlling board. To anyone doing this, I recommend orienting the single LED boards as shown on page E24 in the WOZ manual. Which brings me to another point about the instructions. A number of places the instructions reference another set of instructions contained in the Wizard of Oz Operations Manual. This is especially true towards the end of the project. In this day and age of Copy and Paste, why couldn’t the relevant sections be included in the 2.0 upgrade instructions? It would have been a lot easier to work from one document rather than juggling two (or in my case, juggling printed instructions with an iPad). In spite of trying to get the project completed in a day, in the end, the upgrade kit was missing a cable. So it will require another visit to install the missing cable, tidy-up and install wire ties to the new cabling, and test. But I consider the project 98% completed.